Mix the beetroot with the oil and salt, transfer to a baking tray lined with baking paper. Bake for approx. 25 mins. in the centre of an oven preheated to 200°C. Finely puree in a blender. Place the potatoes, with their skins on, in a pan, cover with water and bring to the boil. Reduce the heat and cook the potatoes for 30-40 mins. (depending on size) until soft. Drain the water, allow the potatoes to dry, peel and press through a ricer or food mill into a bowl. Mix the flour with the salt and add to the potatoes along with the egg and the beetroot puree. Using your hands, quickly process to a smooth dough. Add more flour if necessary. On a work surface dusted with flour, shape each quarter of the dough into a roll 1 cm thick. Use a knife to cut into pieces approx. 1 1/2 cm long, shape these pieces into balls and press the typical pattern into the gnocchi with the prongs of a fork. Bring the salted water to the boil in a large pan. Add half the gnocchi and leave to steep until they rise to the surface, then finish cooking for approx. 1 min. Remove the gnocchi with a slatted spoon, drain and keep warm on a plate. Repeat with the 2nd batch of gnocchi. Melt the butter in a small pan. Sauté the garlic in the butter. Add the walnuts, orange zest and juice and torn-off thyme leaves. Swirl the gnocchi in the butter. 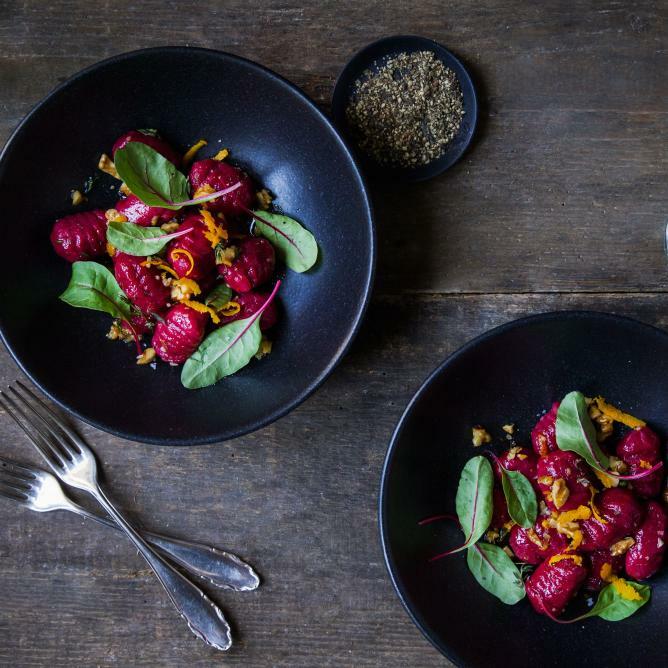 Serve topped with parmesan shavings and beetroot leaves.